This is my shaker card that I always include. I started with a Lawn Fawn large stitched rectangle for the card front. Then I die-cut an MFT scalloped circle die from the top center. I used that for the shaker window. I backed the window with a piece of watercolored paper that has reds and pinks. I filled the shaker window with the PPP Valentine's mix jewels, lots of PPP heart sequins (all listed int eh supply list at the end of this post) and some sparkling clear 3mm sequins. 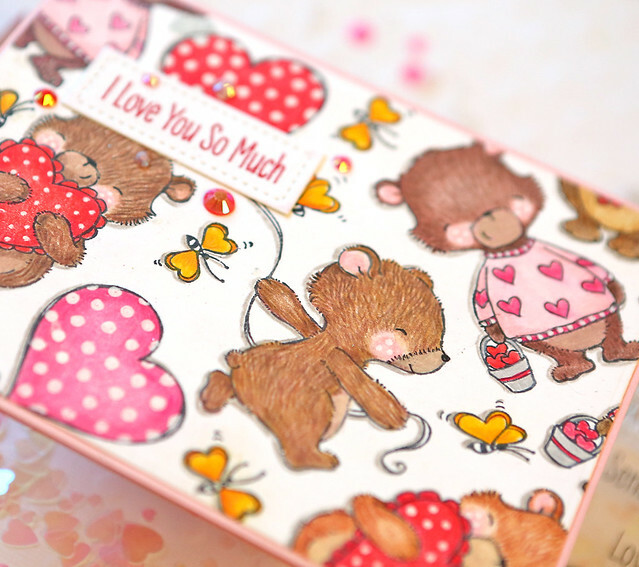 I stamped the images on white cardstock with MFT natural ink and colored them all in with colored pencils. I used a black fine tip marker for the balloon strings and details. I colored two balloons so I could cut one off and use two on just one bear. I layered all of the stamp images on the front of the shaker window. I stamped the sentiment on the bottom of the card with Intense Black Ink by SSS. I added some additional Valentine's Day Jewels around the front of the card. This card looks way better in real life. I think the pink of the bear just looks kind of washed out here, but it really is cute in real life! I had to color one of the bears pink! I started with a background that I had made with Distress Oxide Inks on this blog post HERE where I make backgrounds ahead of time. I used an MFT rounded stitched rectangle die for the white portion. I die-cut the clouds using the MFT Spring Scene Builder die (I used both the clouds and the tree tops). I covered them all with Glossy Accents and added white glitter to them. 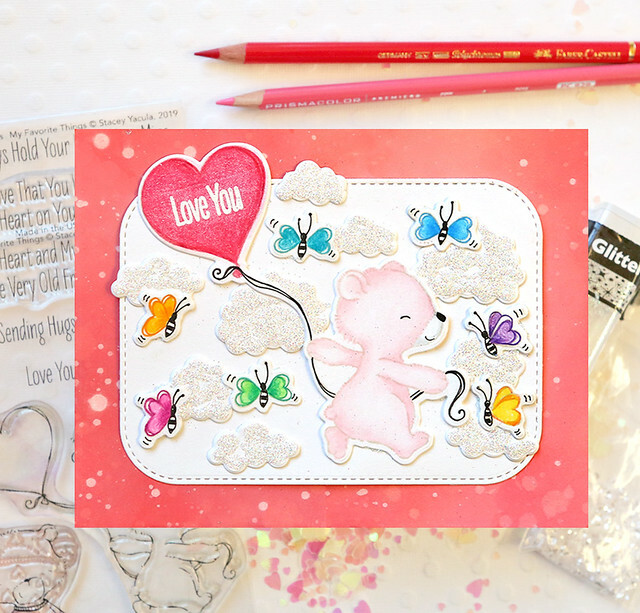 I stamped the bear and all of the butterflies on white cardstock with MFT Natural Ink. I colored them all with colored pencils. I attached them to the rectangle along with my glittered clouds. 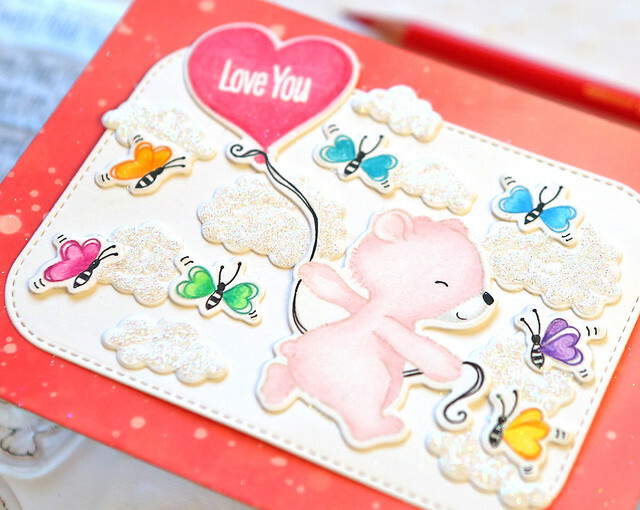 I then stamped the sentiment on the red balloon with white embossing powder. This is my randomly stamped card. 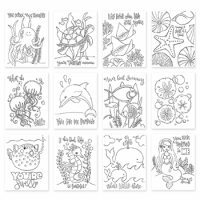 I stamped all of the images with Intense Black Ink and then colored them in with colored pencils. I added shadows to each image with a gray colored pencil. I used a white uniball marker for the white dots on the balloons and hearts. I used the colored pencils to make the fur on the bears look more realistic by adding little lines in different shades of brown. I colored all of the butterflies with yellow colored pencils which totally didn't match the color of the card, but I liked throwing in some yellow! 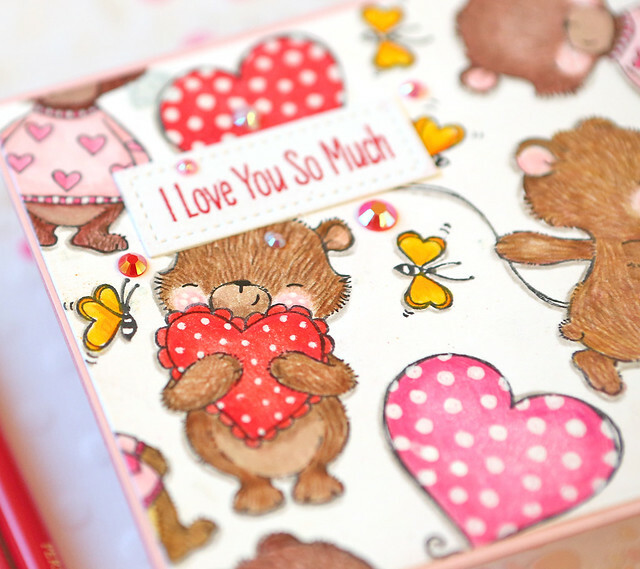 I stamped the sentiment on the smallest LF stitched rectangle with embossing ink and embossed with Red Geranium embossing powder. I used some Valentine's Mix Jewels around the sentiment. This is my favorite card. 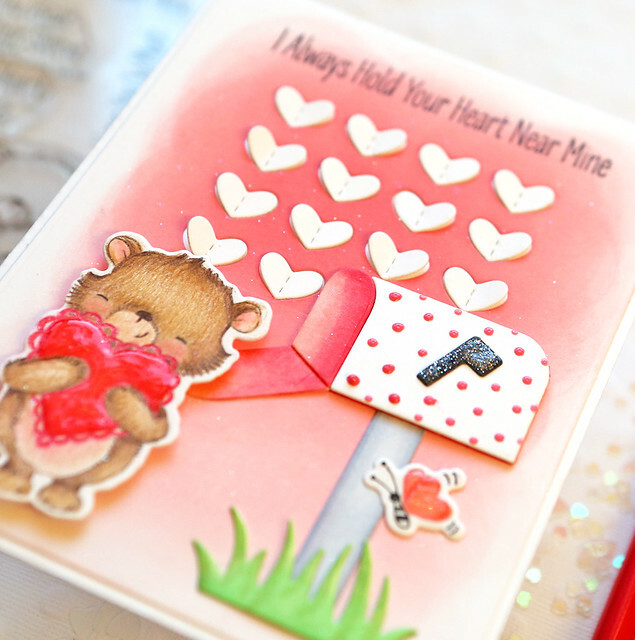 I found a couple of my older MFT dies to use on it that went with the Valentine theme going. 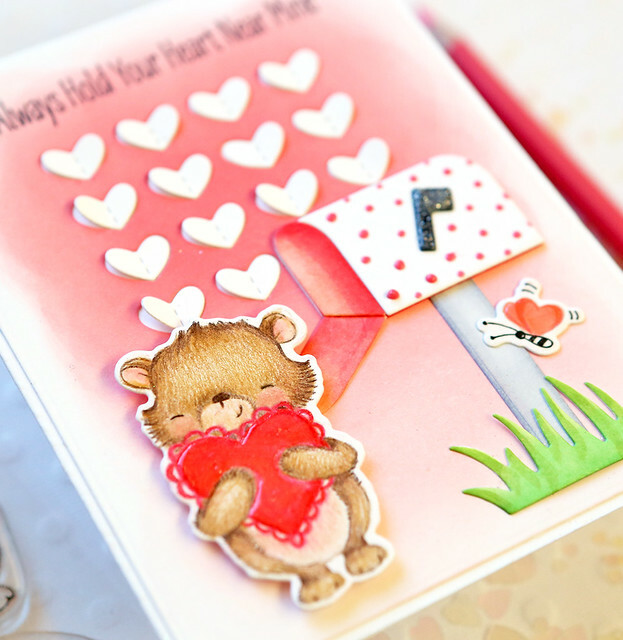 I found the Stitched Heart Grid die at SSS, but it is no longer on the MFT site. I love it though! 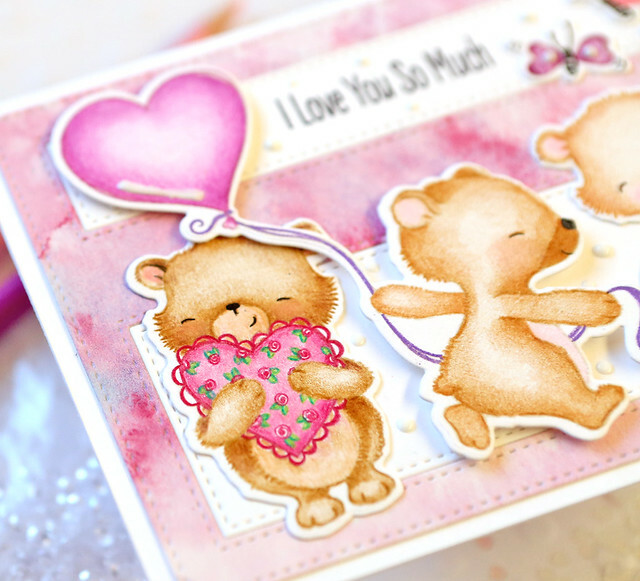 I die-cut the hearts from the top of a white card front. 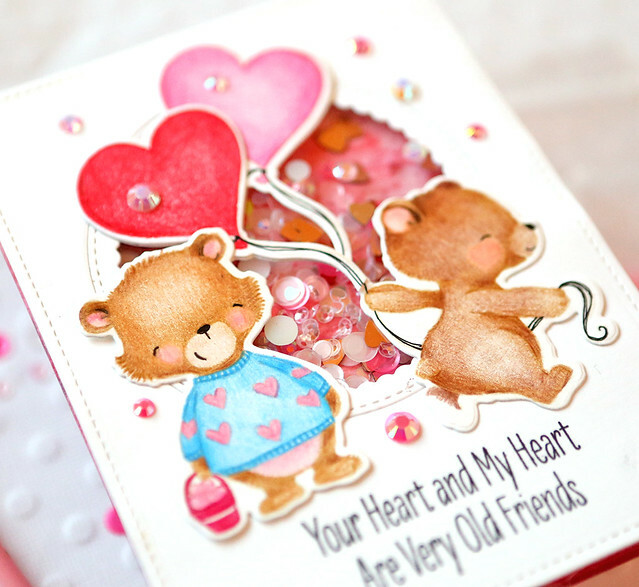 I removed the hearts and then used Distress Oxide Inks around the heart area with Worn Lipstick and Spun Sugar ink. I then replaced all of the hearts and bent the edges up just attaching them in the center of each. I also found a mailbox die I had from MFT, but I can't find it on their site or in the SSS store - sorry! I colored that with Copic Markers and then placed that on the right side of the card. I used some Tonic Nuvo Drops in pink over the mailbox. I used silver glitter ones on the little flag on the mailbox. I colored in the bear and butterfly with colored pencils and attached them to the front. 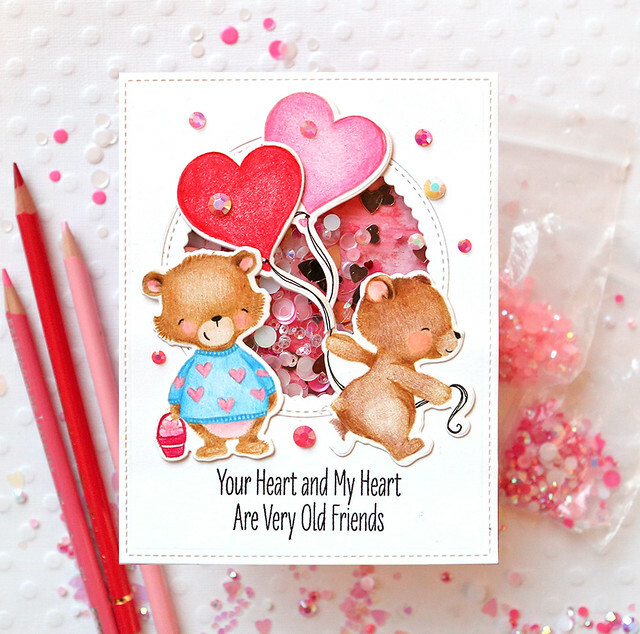 I used a red glitter pen on the heart the bear is holding and then Strawberry Coulis Nuvo Drops over the heart for extra shine and dimension. stamped the sentiment on the top of the card with black ink to finish it. I love how this one turned out! 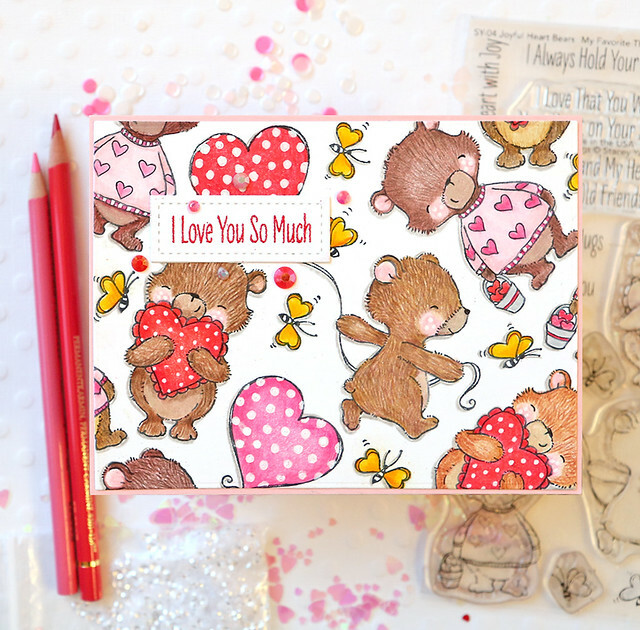 I used another older MFT die for this card that I also can no longer find on their site or in the SSS store! It is one of their cover up dies and they do have quite a few others to choose from. It is also similar to the PPP Storybook dies. I liked how the opening at the top was long enough to add the sentiment in the center. I painted the outside of the die with Daniel Smith Watercolors. 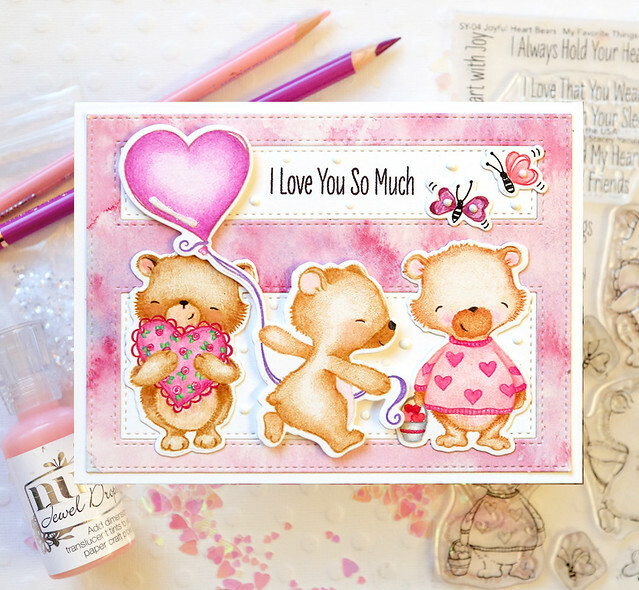 I stamped the bear stamps with MFT Natural Ink (again) and colored them all in with colored pencils. I used a purple colored pencil for the balloon string. I attached all of them to the front of the card. I used foam tape behind the middle one so one stood out more than the others. 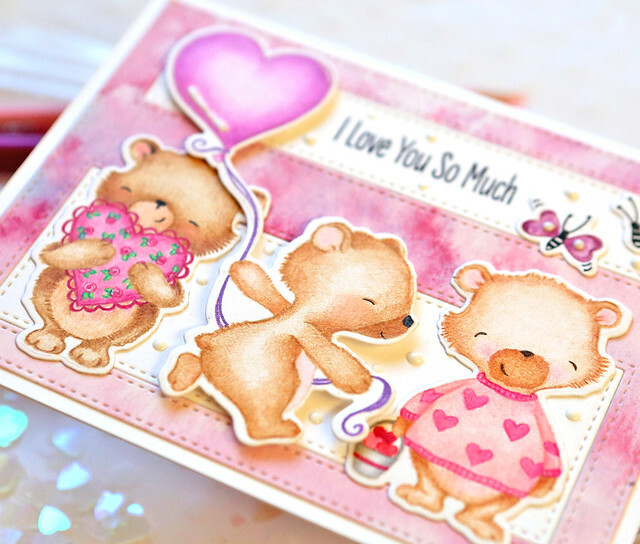 I used white glossy nuvo drops around all of the images on the front of the card.